MANALAPAN, NJ — August 6, 2018 — Travis Ceppaluni, Katie Eick, Ryan Fusco, Liam McDermott and Olivia Miller were selected to receive the SBOANJ and BCAP scholarships for 2018. 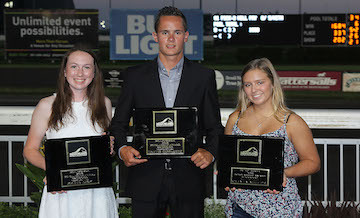 Travis Cappaluni, Katie Eick, and Olivia Miller accept their awards. Travis Ceppaluni of Jackson, N.J., is the son of Christopher Hubert and Shannon Ceppaluni and was also a 2017 SBOANJ scholarship recipient. He will continue to study at Ocean County Community College this year, where he received High Honor Roll his first two semesters. Katie Eick of Farmingdale, N.J., was the National Honor Society Award winner for the 2017 - 2018 school year and captain of the field hockey team at Howell High School. Daughter of Floyd and Jennifer Eick has been accepted to many top universities but plans to attend Rutgers University and majoring in Animal Science. Ryan Fusco, the graduate of Jackson Liberty High School, has committed to attend University of North Carolina Charlotte in the fall. Son of Paul and Robyn Fusco, Ryan was the recipient of the Science National Honor Society and Captain of his Varsity Golf team. Liam McDermott of Allentown, N.J., was captain of the Allentown wrestling team and received the Principals Award Senior Male Student. Liam is the son of trainer Kevin McDermott and Sheri McDermott, he plans to attend Roger Williams University. Olivia Miller, daughter of driver Andy Miller and trainer Julie Miller of Millstone, N.J. will attend Fairleigh Dickinson University where she will pursue a degree in Nursing. Olivia received the National English Honor Society award while Cheerleading at Allentown High School. Each student received a $2,000 check and a plaque from the SBOANJ and BCAP associations at the Meadowlands.